POMONA >> Immigrant rights advocates are urging the Pomona City Council to adopt an ordinance they say would ensure proper implementation of Senate Bill 54, the California Values Act, which was signed into law this fall. 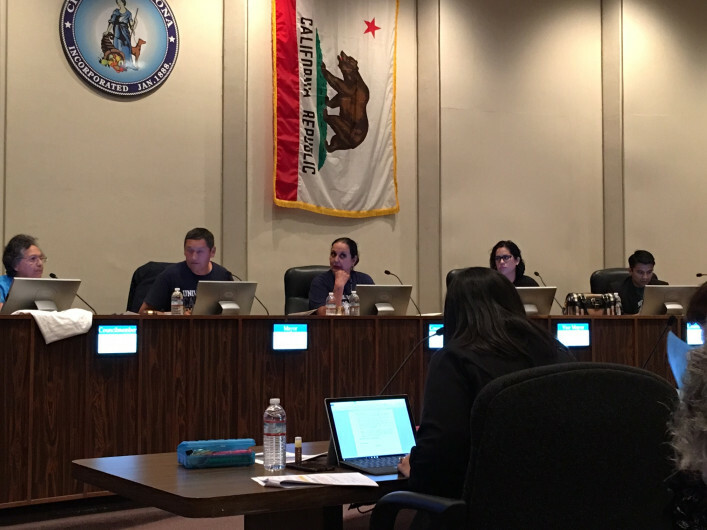 The advocates, members of the ICE Out of Pomona Coalition, attended the Nov. 6 Pomona City Council meeting calling for placement of a proposed ordinance on a future agenda for council consideration. Having a local ordinance in place would complement the state legislation and give some within the city’s immigrant population peace of mind, said Fernando Romero, executive director of the Pomona Economic Opportunity Center, also referred to as the Pomona Day Labor Center, and a member of the Coalition. In the case of residents of the city who are living in the country without proper immigration documents, a local ordinance would be particularly beneficial when interacting with police, he said. “They will have a lot more trust in the police,” Romero said. Mayor Tim Sandoval said the matter is one that is currently under review. “But I continue to reiterate that we support all residents in the city of Pomona,” he said. In October, Gov. Jerry Brown signed the California Values Act, sometimes referred to as sanctuary state legislation. The legislation goes into effect Jan. 1, 2018. In general, the state legislation prohibits state and local law enforcement agencies from using their resources for immigration enforcement purposes including investigating, interrogating, detaining or arresting people. Adopting a local ordinance would ensure all city employees have the necessary training in order to follow the state legislation, Romero said. This would be “training on how to approach and how to interact with the immigrant community,” he said. But just as some favor adopting an ordinance others oppose the concept. Among the latter are Upland resident Robin Hvidston, executive director of the Claremont-based We The People Rising, and members of the organization. Hvidston said elected officials should focus on other matters such as the plight of veterans, the disabled, the unemployed and those who are homeless instead of those in the country illegally. “We should be putting our focus on American citizens first,” Hvidston said. “Our side is always for the American citizen and upholding the laws, the federal immigration laws. That is the law of the land,” Hvidston said. Adoption of proposals such as the Coalition’s sends a message to those who engage in human and drug trafficking activities, she said. Attorney James Sanbrano, a member of the Latino/Latina Roundtable of the San Gabriel and Pomona Valley and a coalition member, said having an ordinance ensures Senate Bill 54 will be implemented properly. It would also ensure a committee will be impaneled that would provide recommendations on addressing matters associated with the interaction of the public and city employees involving Senate Bill 54, Sanbrano said.